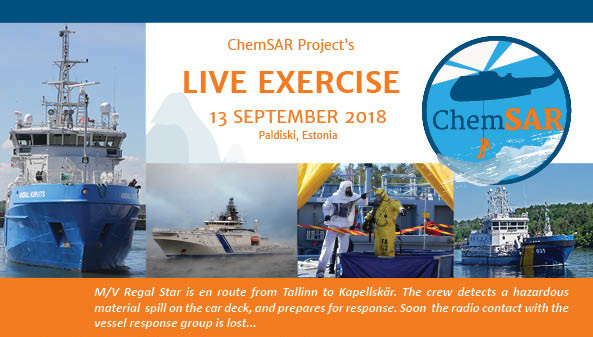 ChemSAR project has created standard operational procedures (SOPs) to be used in the maritime search and rescue operations in hazardous and noxious substances (HNS) incidents. The aim of the ChemSAR live exercise is to test the SOPs and other results of the project, namely the SOP checklists and the chemical databank, as well as to enhance the cross border co-operation and coordination of resources between the neighbouring countries. The exercise is a joint operation between several authorities from different Baltic Sea Region countries. The exercise will be arranged in Paldiski, Estonia, 13th of September. If you wish to come and observe the exercise (but haven’t received an invitation), please contact Kirsi Laitio (kirsi.laitio@utu.fi) and we’ll arrange it.